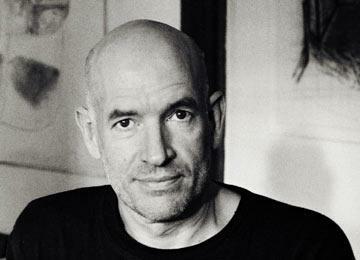 Andries Gouws describes himself as a bald Dutch-South African Buddhist-Calvinist bourgeois painter. He is known for his small meditative paintings of unremarkable topics such as interiors or feet. Gouws studied fine art in Cape Town, Düsseldorf and Amsterdam, and philosophy in Utrecht (the Netherlands). Having spent 16 years in Europe, he returned to South Africa in 1987. His one man shows “Hiding behind simple things” (2006) and “Pedestrian Paintings” (2011-12) travelled to all the major centres in South Africa, after his previous one man shows in Durban, Cape Town and Chicago. Following years in which he earned his keep as a philosophy lecturer in the Netherlands, Stellenbosch and then Durban, he now lives in Jamestown (Stellenbosch) as a full-time painter and painting teacher. Gouws is married to the novelist and artist Ingrid Winterbach, and they have two daughters.